We were based in the resort town of Ao Nang in Krabi coastal province. Ao Nang, known for having the world’s second finest beach, provided us with a different experience than Koh Klang, the small fishing island where we had been staying in for the past few days. Before the tide recedes, we reach the Divided Sea at Ko Thap and then stop at Ko Mo. The islands are thronging with tourists. Jostling for some personal parking space is like asking for the moon here. But the beauty of the surroundings compensate all the touristic chaos. The sunset here is marked with flight of flying foxes, tens and thousands in number. Before heading to the Poda Island, en route is the Ko Kai or the Ko Dam Hok Dam Khwan, where the rock sculpture has taken the form of a rooster’s head – naturally. The shell laden white beach, boats converted into small make shift floating restaurants, small rock islands jutting out of the water in the horizon – Ko Poda is absolutely charming. I simply fell in love with this island. I was fascinated with the busy lives revolving inside the boats – families resided here and members helped each other to prepare food for the tourists. What were these small restaurants not offering? Pancakes to Pad Thai, Barbeque chicken to chilled beer – everything was available here. And the huge banners swaying in the breeze reconfirmed that. By the time we landed in Ko Poda, the sun was overhead and it has started to become very very hot. I really felt touched when a chilled fresh watermelon juice (below) waited for me as I took a breather from my camera – courtesy Debbie, my blogger friend who had accompanied me on this trip. Daeng means red and Hin means rock in Thai language. In Hin Daeng or the Daeng Island, suddenly the rocks here turns brazen red. The water is the colour of the emerald and it was evident that it was deep. The island itself is formed out of a rock coming out of the sea and revealed underneath the green water are some spectacular coral formations. According to John Williams, of the award-winning Lonely Planet Diving & Snorkeling series – This is one of the four principle places for diving in the area south of Phi Phi islands and offers everything a diver could want, from dramatic walls and big fish action, to lush tropical underwater. Hong Island – this is where I felt the presence of the Almighty. Surrounded by limestone mountains, mini lagoons with crystal clear green waters, fine white sand and lush green forests, Ko Hong seems like a cocooned paradise on earth. In spite of the large number of tourists visiting this island, one can still have a ‘deserted island’ experience. There is a profound feeling as the island resonates with the chirping of birds (hope you’ve heard the recording by now). Though it sounds strange, but there is a strange silence looming in the island. The chirping of the birds and the crickets sound almost like a prayer or a chanting. Hong means room in Thai language. There are eroded group of caves in the middle of the island which harbours a large lake with a small passage to the sea. 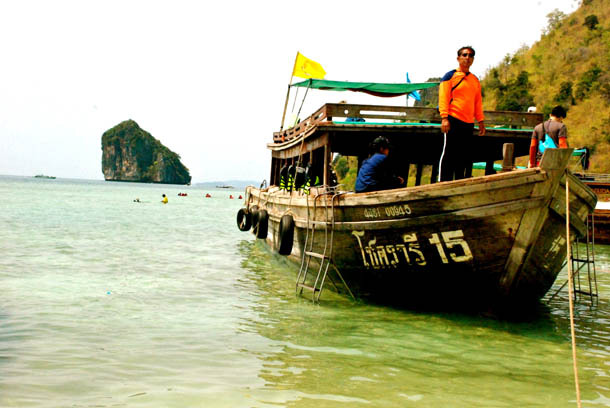 When the tide is high, long tail boats are able to enter the ‘room’ and tourists can swim in the crystal clear water with a depth of around one metre. Interestingly, Koh Hong is also a collection point for the nests that provide the ingredients for bird’s nest soup. Young men risking their lives, climb up bamboo poles to great heights to collect these nests, which can fetch up to 100,000-120,000 baht for a kilo of unprocessed nests! As I was rewinding the day in the resort that we were staying in, I was asking myself whether it was the statistics (one of the top 10 destinations in the world) that made Hong Island so special? Or was it the archaeological formation (a copybook archipelago nurturing an amazing underwater life)? I definitely had witnessed the presence of the Almighty that day in the Island. A feeling beyond my power of expression. I felt that the Creator can only dwell in an island like Hong, where the evidence of life throbbed in the breeze blowing through the leaves, waters washed in colours that lured the fish and the birds chirping through the howling wind. And the sanctity of the island should be maintained by leaving the island to its rightful owner, at the end of the day! Disclaimer: The Thailand Academy trip was an invite from the Tourism Authorities of Thailand Middle East and Aviareps Group. However, the opinions stated here are my own and are independent. This was definitely one of my dream destinations. I do hope you enjoy reading the posts with lot of visuals. Please do not use any material from this post. You can see more pictures of my travel and food journey here. • Kotung Restaurant in Krabi Town | A Taste of Thai Chinese• Kayaking, Caves, Krabi Sightseeing… And Finally A Thai Spa! ← Kayaking, Caves, Krabi Sightseeing… And Finally A Thai Spa! oh my… it’s like a dream. I sort of want to sell everything and buy a backpack and head out. Beautiful images you have shared. So appreciate seeing what is happening out in this wide world. So much diversity. I’m sitting on wood stool at my shop, staring out my open, sliding garage door at the moment, thankful the drizzle has taken a short rest. Happy travels. PS – You have to come check out the islands in the Pacific Northwest some day:) Very different but very beautiful. And I thought that you just got sorted out, unpacked your cartons. Please don’t think of selling anything right away! Always love it when you leave a comment – a few blogger friends who have been there from the very beginning. Pacific Northwest – different in what sense, Wendy? Couple of things other than that. Hey thanks so much! About God, I’m not ritualistic about religion – for me I celebrate all festivals from all religion simply because I like the beauty of it all, the story, the tradition behind each festival and love to be immersed in the faith or belief. But when I landed in Hong Island, I felt that even an atheist cannot deny the presence of ‘some power’ – whatever you call it, in the creation of such a natural beauty. Beautiful photos, Ishita! I feel like I have taken a mini vacation through this post. Thank you! Wow! That is such a beautiful, gorgeous place to unwind. Your photographs and descriptions of the place transports us to these islands. Ishita, thank you for taking me there with you. Thank you Nadia for leaving such a warm comment… I’m glad that you were transported to the places that I’ve described. Fascinating photos of the islands! I want to go there but preferably not when it’s too hot! I can almost feel BettyBooDubai’s sunburn! OUCH! Thank you Grace! Wasn’t it hot when you had travelled? Fascinating! Paradise on earth! This place deserves a place on my wish-list. One of the best Daily Prompts ever- you really take us on a wonderful journey! Thank you for dropping in (sorry for the subtle force!) Curious, no one is allowed to stay back in Hong Island after 4pm. How is one supposed to stay back then? Oh please don’t apologise! Happy to have found a kindred spirit and a hong enthusiast! 😉 Not sure about the rules in Krabi but in Phuket you can visit the caves at night. The John Gray’s ‘Hong by Starlight’ tour is quite popular (the same one we took).